This study aimed to develop a big book media based on fieldwork, needs analysis, and the study of literature in kindergarten. This research and development is adopting the model of Borg & Gall with the stages consisting of: (1) research and information collecting, (2) planning, (3) developing the preliminary form, (4) preliminary filed testing, (5) main product revision, (6) main filed testing, (7) operational product revision, (8) operational field testing, and (9) final product revision. The subjects of the preliminary field test was one class, and those for field test were five classes. The subjects of the operational testing were eleven classes. The data was collected through interviews, validation product, observation, and questionnaires. The data analysis technique used was inter-rater reliability and Cohen’s Kappa with SPSS program version 22. The result of the research was the big book media and its guide book that consisted of introduction, basic competencies and indicators, steps of using the media, and daily activity plan. The result of material expert showed that the material was in a sufficient category. The result of media expert showed that the media was excellent. The result of preliminary field test, field test, and operational test were valid according to Aiken validity. The agreement of teachers in field test with Kappa coefficient value showed 50% or moderate. The agreement of teachers in operational test with Kappa coefficient value showed 51,78% or moderate. The literacy ability of children at operational test improved well. Biddle, K.A.G, et al. (2014). Early chilhood education becoming a professional. California: Sage Publications,Inc. Boove, C. (1997). Business communication today. New York: Prentice Hall. Borg, W.R & Gall, M.D. (1983). Educational research an introduction (fourth edition). New York & London: Longman. Brewer, J. (2014)). Introduction to early chilhood education: preschool through primary grades. England; Pearson Education Limited sixth edition. Brown, E. (1980). The bases of reading acquisition. Reading research. Colville- H, S & O’Connor, B. (2006). Using bog book: a standards-based instructional approach for foreign language teacher candidate in preK-12 program. Foreign Language Annals, 39 (3), 487-506. Gagne, R.M. & Briggs, L.J. (1979). Principles of Instructional Design. New Yorks: Holt Rinehart and Winston. Heinich, R.,et al. (1996). Instructional media and technologies for learning. New Jersey: Prentice Hall, Englewood Cliffs. Jalongo, M.R. (2007). Early chilhood language arts. USA: Pearson Education, Inc.
Jamaris, M. (2006). Perkembangan dan pengembangan anak usia taman kanak-kanak. Jakarta: Grasindo. Lynch, P. (2008). Using big books and predictable books. Scholastic: Canada Ltd.
Mena, J.G & Eyer, D.W. (2009). Infants, toddlers and caregivers a curriculum of respectful, responsive care and education eigth edition. New York: The MCGraw-Hill Companies,Inc. Meyer,E.R. (2008). Learning and instruction. Second edition. Upper sadle river, N.J: Pearson Merill Prentice. Normaliza, A.R & Nik, I.H. (2010). Student’s perception towards the usage of the big book. 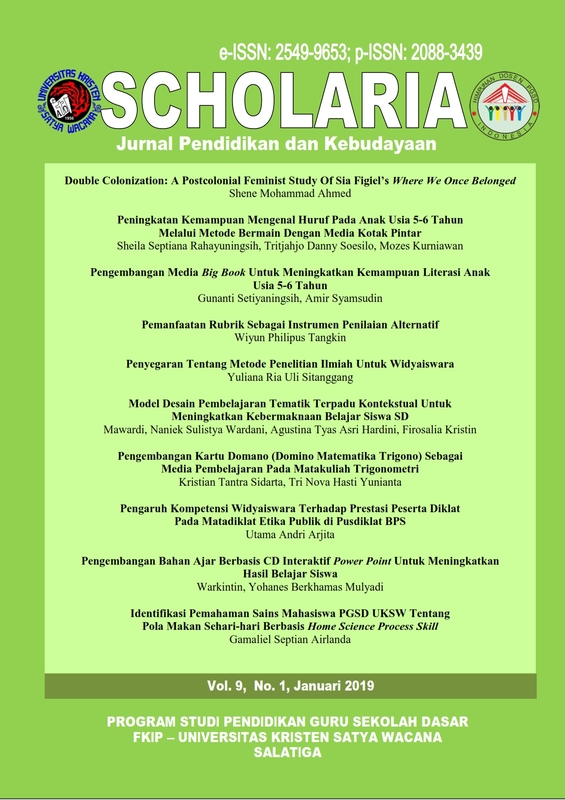 Gading Business and Mangement Journal Vol.14. Pilgrim, J & Martinez, E. E. (2013). Defining literacy in the 21 st century: a guide to terminology and skills. Texas Journal of Literacy Education Vol.1 Issues 1. Sadiman, A. (2014). Media pendidikan. Jakarta: PT RajaGrafindo Persada. Solehuddin, dkk. (2009). Pembaharuan pendidikan TK. Jakarta: Universitas Terbuka. Suyanto, K. (2007). English for young leaners. Jakarta: PT Bumi Aksara. Tompkins, G. E & Hoskisson, K. (1995). Language arts content and teaching strategies. USA: Prentice-Hall, Inc.
Thomkkins, G. (2001). Literacy for the 21st century: a balanced approach 2nded. Upper Saddle River, NJ: Merill Prentice Hall. Walker, D.F & Hess, R.D. (1984). Instructional software: principle and perspectives for design and use. California: Wadsworth, Inc.
Yaacob, A & Pinter, A. (2008). Exploring the effectiveness of using big books in teaching primary english in malaysian classrooms. MJLI Vol 5.